Danny Worsnop of Asking Alexandria and We Are Harlot fame has gone solo and released a country record. We’ve seen stories like this coming out of Nashville in great Americana records by Don Henley, to more questionable releases from Steven Tyler. Danny certainly has a story to tell, from homelessness to drinking problems and hospitalisations, and it shows in the record, with plenty of well-written songs that do feel personal to him. ‘’Prozac’’ is one good example of a song which opens him up. There is no surprise that the melodic and instrumental delivery is quite mainstream, but the writing is the key ingredient giving this song its power. Describing the high life, whilst his bands are successful and everything is going his way is suddenly contrasted very quickly to the bad times; Got crucified and came back to life with caffeine and a pill. As a starting track to a re-birth album ‘’Prozac’’ was a good choice, laying it all out there and setting up the rest of the record for some mainstream soulbearing. ‘’High’’ covers similar subjects as the fall from grace; Thought I’d hit the bottom but not yet hit the ground. This song is very different stylistically though, being a stripped-back ballad, with some brilliant falsetto vocals, reflecting the vulnerability of the lyrics in the vocal performance. Danny has a great voice, with clear strength but allowing the tenderness to show through, and there is no better example than on ‘’High’’. Danny then shows his heavy Rock roots in ‘’I Got Bones’’, which goes full-in for a heavy electric guitar and gritty chorus. Likewise the record departs from its Americana roots in ‘’Mexico’’ which is mainstream Nashville country, with a bit of gentle hick-hop and lyrics exploring girls and beer. Whilst these do tend to throw the album a little, the overall effect is solid writing and good vocals. ‘’Quite A While’’ is another solid song exploring the relationship between Jesus and the Devil and how Danny lost religion over the dark years. Again, it doesn’t contain a lot of musical complexity, but as far as the vocals and the writing goes, the song holds up to scrutiny. ‘’The Long Road Home’’ is nice to listen to. Whilst it isn’t groundbreaking musically, it is solidly written, and Danny has great vocal performances throughout. For a first solo album it gets a thumbs up, and certainly commercially it should perform well, possibly allowing the sophomore album to take a few more risks. 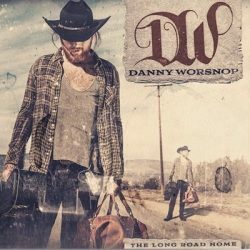 Danny Worsnop releases a first solo record, baring his demons that have held him back.